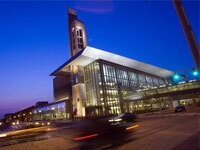 The Fuels Institute held their annual meeting in downtown Indianapolis. Two new fuel cell vehicles were available for demos, the Toyota Murai and the Hyundai Tuscon. Mr. Bill McLeod of Hyundai brought his vehicle to IUPUI where a dozen students turned out for an overview and a ride around campus. Many probing questions were asked - and answered. The Tuscon seated 5 comfortably and provided a smooth, quiet ride with plenty of pick-up. Currently these vehicles are available only for lease on the west coast.